Say Namaste as you enter Shalom Bombay (344 Lexington Avenue – between 39th and 40th – New York, NY 10016 – Tel: 212.922.0224 – Fax: 212.922.0124) this exotic Indian adventure. Above your head flows the Ganges – the life force of a nation. The environment is earthy with touches of scrolled ironwork wall pieces, and the tables are set simply- as all guests are welcomed with an introductory taste of a dish called Papri Chaat, complements of the house. 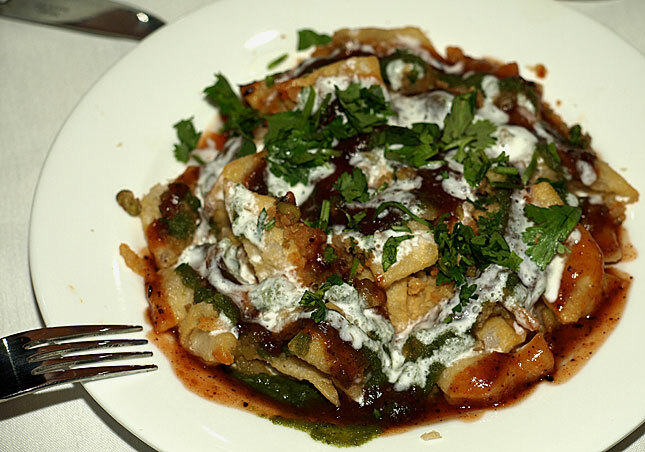 It consists of crispy crackers served with chopped potatoes, onions, parve sour cream and tamarind sauce – served cold. Mildly spicy and flavorful, it set the stage for the rest rest of the meal. SYR and I washed and sampled their breads. SYR adored the warm, fresh from the oven Tandoori Paratha bread (a multi-layered flat whole wheat bread), while I had their just baked Onion Kulcha. Both were superb! SYR chose a Chicken Tikka Masala, while I had their Tawa Chicken. Hers was made with barbecued chicken cooked in tomatoes and onion. Very flavorful, a bit spicey, but definitely interesting. Having grown up in Uruguay, I am more used to spicy food and my Chicken Tawa came with boneless pieces of chicken served with onion, bell peppers and spices. I liked it!! …an assortment of deep-fried spinach, eggplant, cauliflower and potatoes. Frankly, cauliflower was never a favorite of mine, yet… fresh deep fried is just so good when it’s done right. 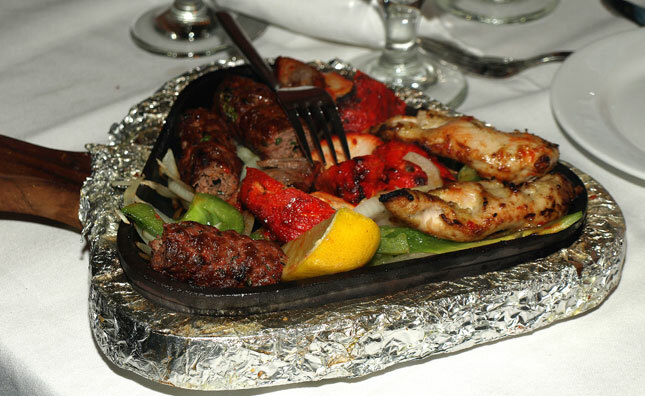 It comes with an assortment of lamb, beef and chicken kababs marinated and roasted in a clay oven. We both found the various meats flavorful, tender and wonderfully spiced. SYR enjoyed a 2009 Herzog Selection, Chateneuf Rouge. A semi sweet, mildly fruity but dry enough wine that amply complimented her dishes. I had the 2007 Galilee Hills Segal Fusion (with 60% Merlot, 20% Cabernet Franc and 20% Sauvignon Blanc), with a somewhat smoky undercurrent and lots of fruitiness, I found it a perfect companion to these spicy foods. We both finished our meals with their exotic desserts, SYR had the Rice Pudding, served with almonds, pistachios and raisins, which she found unusually tasty. I had the Moong Daal Fudge dessert – mashed lentils cooked with sugar and nuts – it was just sweet enough without being overpowering. Kind of likea sweet version of kishka- nice and very tasty, I wish it had been a bit creamier though. It was a great meal, coupled with good wines and great decor. We just have to come back for more, but next time I plan to have some of their Indian beers. I hear the Kingfisher is unusually tasty, spicy… just made for these type of food! Don’t wait for monsoon season to try this superb gastronomic delight; it’s sure to become a fast favorite when you’re ready to curry favor with family and friends or spice up your evening out. This restaurant has O U hashgocho. You are right we should always have the hashgocho organization in every restaurant review. Thank you for reminding us.